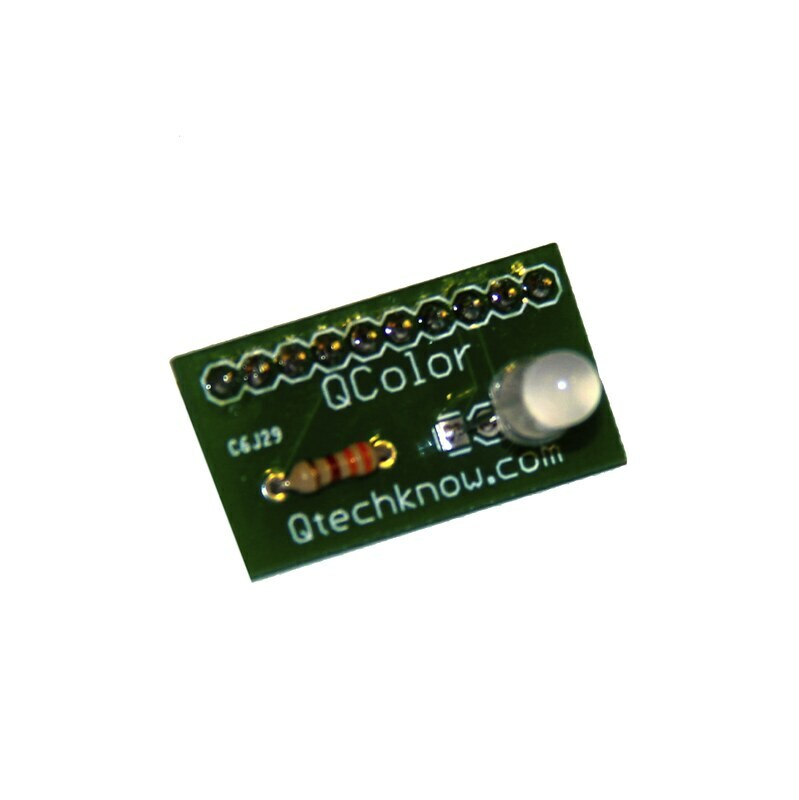 The QColor is composed of an RGB (Red, Green, Blue) LED, and three 330 ohm resistor for the RGB LED. 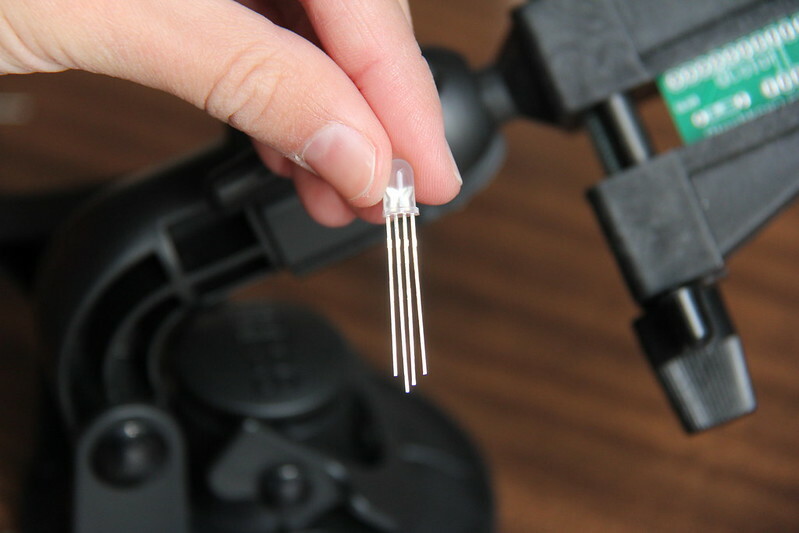 Basically, this LED can produce over 16 million different colors on the spectrum, because it can combine the red, green, and blue colors individually, in the same casing. 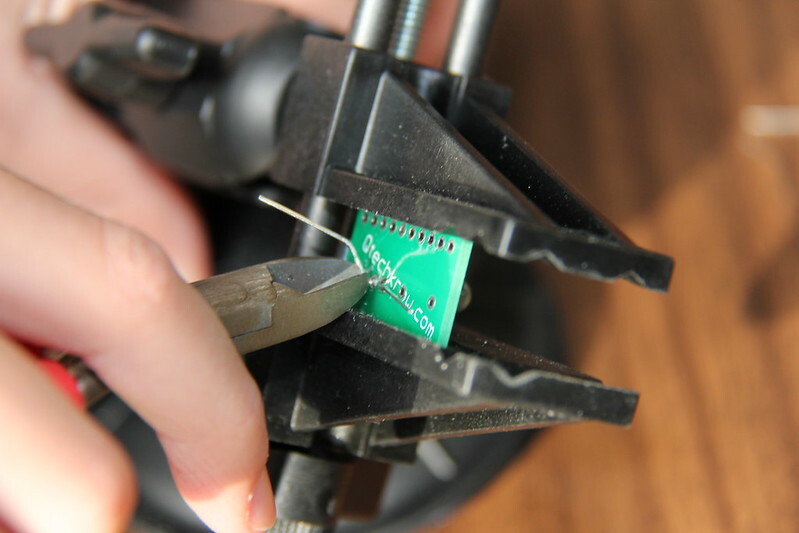 First off, if you don’t know how to solder, go here to learn the basics so that you are thoroughly prepared to assemble your kit. 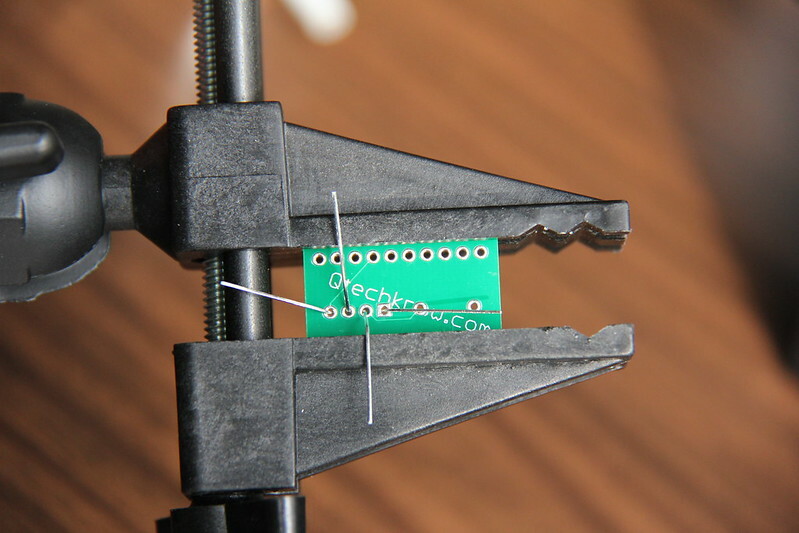 Take out the QColor PCB out of the the bag and put face up into a vice or third hand. 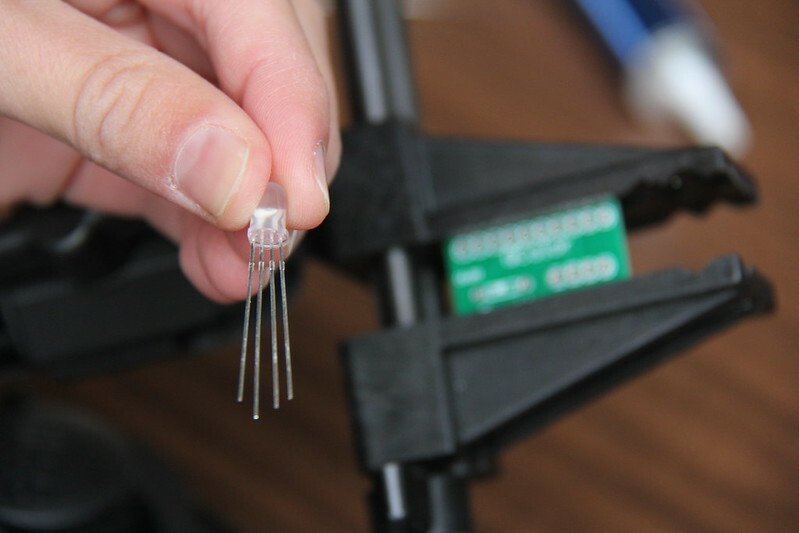 Bend the RGB LED legs a small bit outwards, so that they will fit into the copper holes. Insert the RGB LED into the copper holes corresponding. Make sure that you are putting it in the right way! The longest leg of the RGB LED should go into the circular hole right next to the square hole. 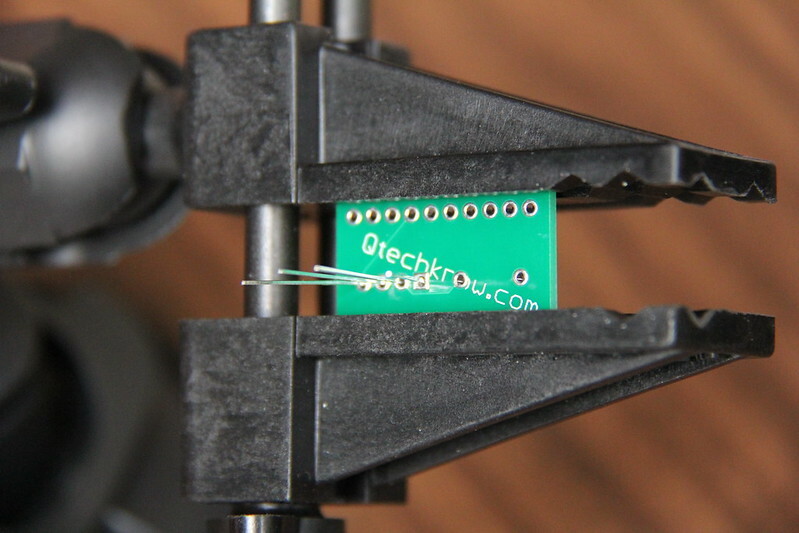 Flip the PCB over and put it back into the vice or third hand face down, so that all of the leads show on the back. Bend the leads outwards in different directions. 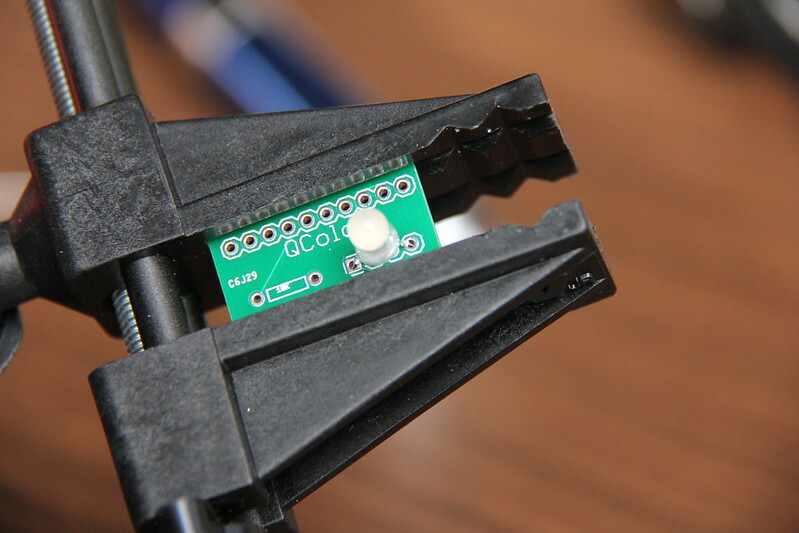 Put your soldering iron on one of the junctions where there is a copper hole, and one of the RGB LED legs popping through it. 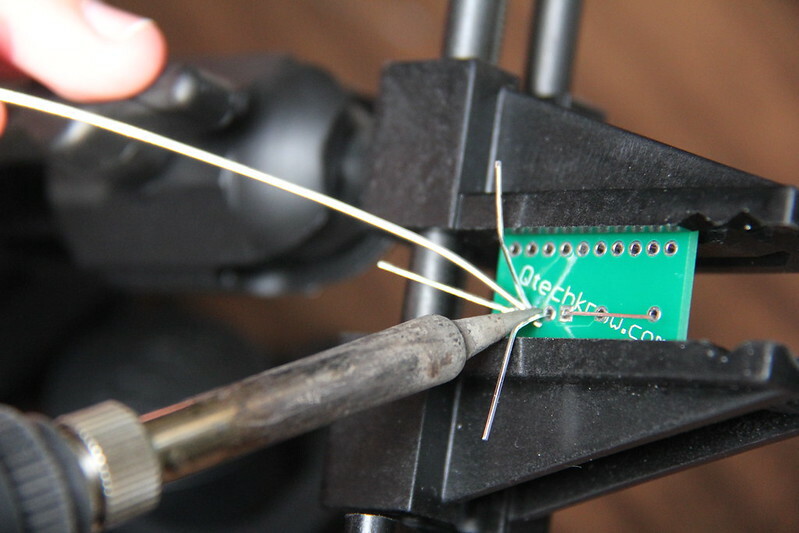 Wait three seconds, and then take your solder, touch it briefly to the junction, and then take your soldering iron away. Repeat this process three more times to the other joints with the copper hole and an RGB LED leg popping through it. Trim the leads so that they don't poke you. 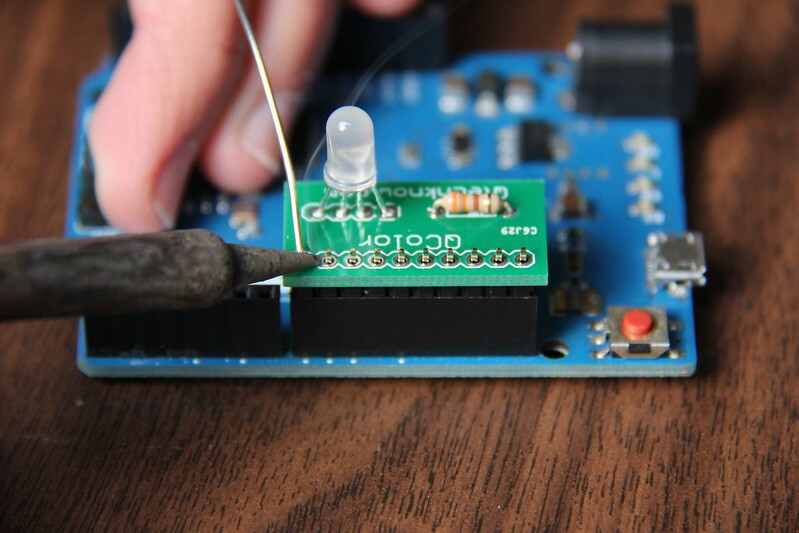 After you are done, flip the PCB over again so that the text and RGB LED are facing upwards. Take your three 330 ohm resistors out. On each, bend the two leads so that they form an upside-down “U” shape. Put the 3 resistors into the corresponding copper holes and bend the two leads outwards in opposite directions. Solder the two copper holes that have resistor pins popping out of them (using the same method as before, repeat three times for all resistors). Trim the leads so that they don’t poke you. Take the 10 pin male header and put them into SCL through D8. It is shown below in the picture. Place the QColor on top of these pins. Solder in place. 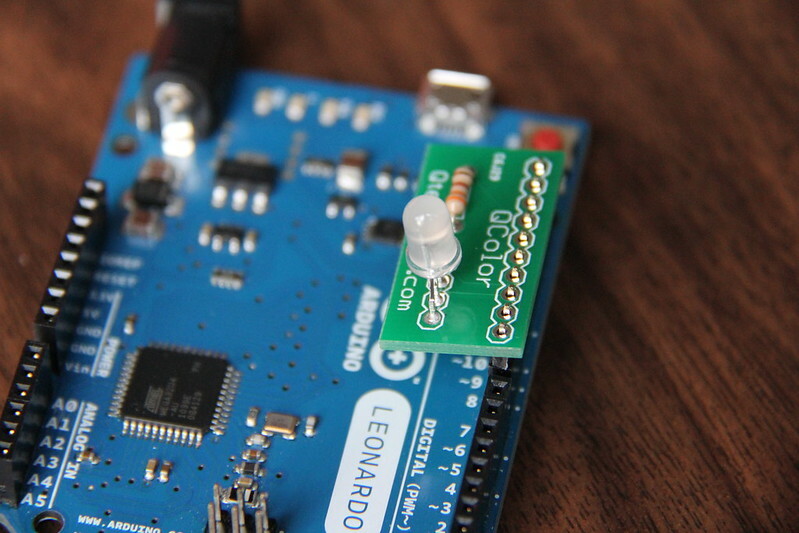 But make sure that you don’t put too much solder in, because that can cause the QColor to be permanently installed on your Arduino! 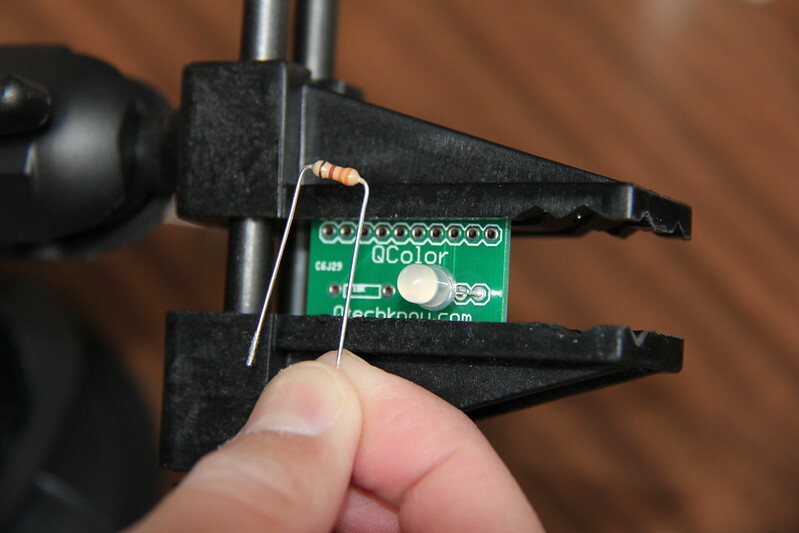 Wait for the QColor to cool off (around 20-30 seconds), then pull out of the Arduino sockets. 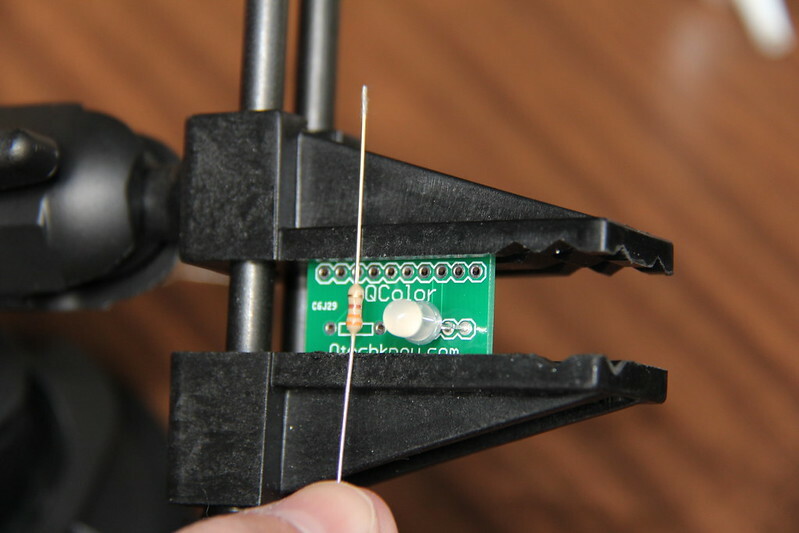 Now you are finished soldering your QColor! 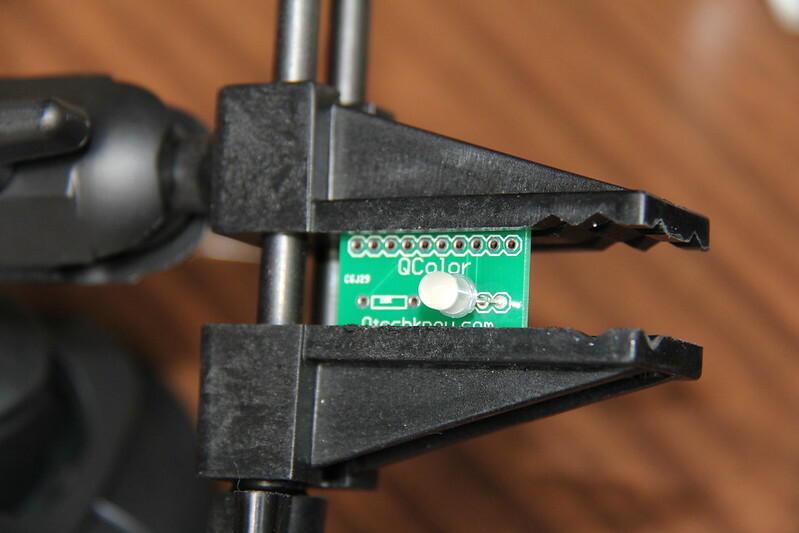 Put your QColor in pins SCL through D8, like before. 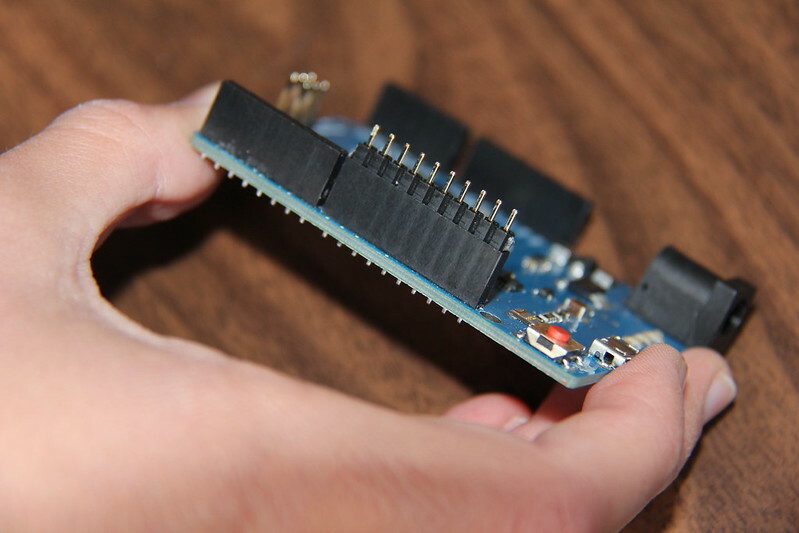 Plug in your Arduino with your USB cable (USB-B on the Arduino UNO or earlier, and USB-microB for Arduino Leonardo) to your computer. Download this zip file and unzip onto your computer. If you are on a Mac, double click the folder labeled “FishBank-QColor-Example-Code-f78ead3”, double-click the file named “QColorDemo.ino”, then press OK when the dialogue box pops up. If you are on a Windows computer, press Save instead of Open when you press the download button, double click the folder labeled “FishBank-QColor-Example-Code-f78ead3”, double-click the file named “QColorDemo.ino,” and then press OK in the pop up box. 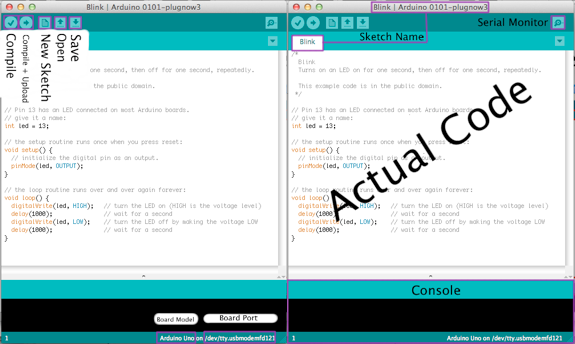 The Arduino IDE should open up with the QColorDemo sketch. This sketch will make the RGB LED on the QColor fade into an amazing range of colors. First, make sure to select the board that you are using from Tools > Board. 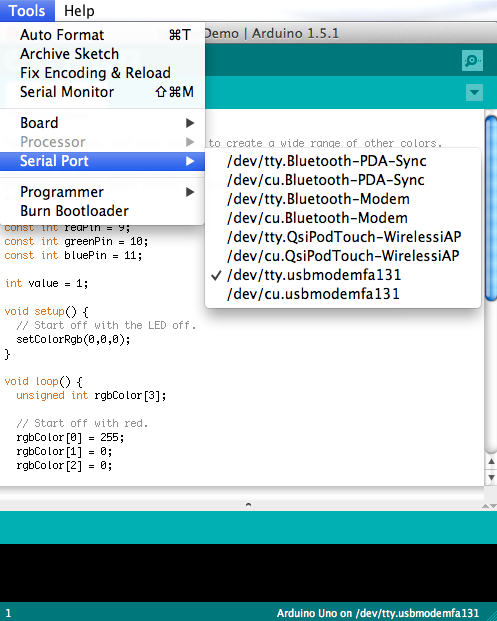 Then, go into Tools > Serial Port, and select the correct COM/Serial Port. On a Mac, the usual Serial Port will be /dev/tty.usbmodemfa131. Any small variation of that will be fine. On Windows, the COM Port will usually be COM 4, and anything lower or higher might work. 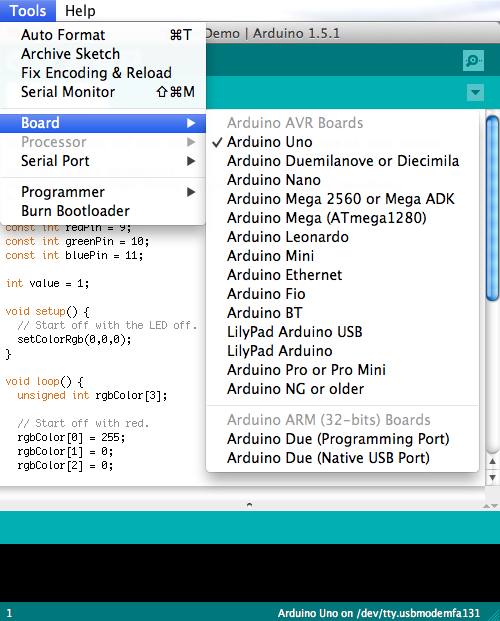 Now let’s upload the sketch/code to the Arduino. Plug one end of the cable into your Arduino, and then the other end into your computer. 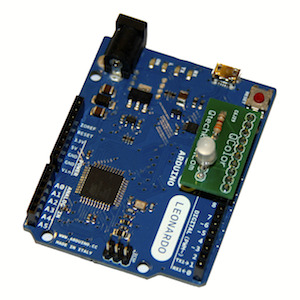 Press the Compile + Upload button (Verify if there is any errors in the code, and then upload the sketch/code onto the Arduino), and the program will run on the Arduino. You should see that the QColor changes to many different colors on the spectrum. Hope this inspires you to make a cool project (with lots of color)!